Do あなた wish Sherlock and Joan would have stayed in ロンドン at least a few もっと見る episodes? Does anyone else think that Mycroft might have been on the phone with Moriarty at the end of 2x08? Are あなた exited about Irene's return in 2x12? ファンの選択: Can't wait! Should be Good! Can&# 39; t wait! Should be Good! where can i get the lamp that sits on the mantle? The lapel pin frequently worn によって Sherlock is what? That the series will get a proper send off is likely an important factor to its fans, and the series is certainly deserving of the opportunity to bring its characters’ overarching narratives to their respective conclusions. 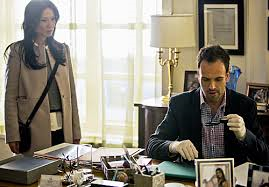 To Catch a Predator Predator is another solid episode of Elementary and another decent case of the week that pits Sherlock and Joan up against the murderer of a vigilante who was responsible for publicly shaming sexual predators on dating sites. Elementary has officially been picked up for Season Six! an answer was added to this question: where can i get the lamp that sits on the mantle? In "Dirty Laundry," what country were the spies working for?